We recommend bringing two classes per visit, however we can cater for one class (or more!). The two classes will take turns exploring the exhibition with our Story Explorer and taking part in a bespoke workshop delivered by one of our Associate Artists. Schools can choose from different artistic workshops including drama & movement, music, visual arts and storytelling & writing, all which focus on a particular Julia and Axel book. 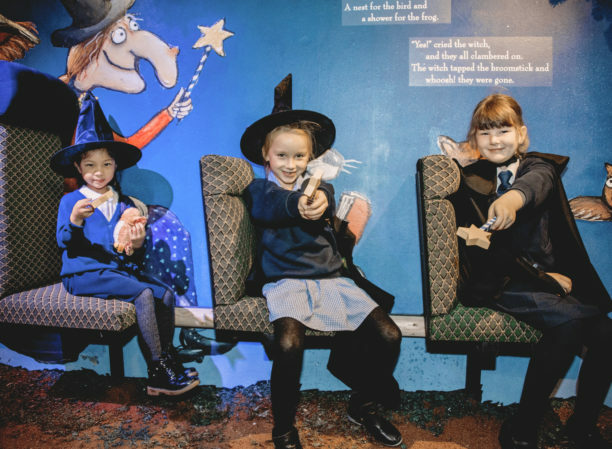 The Story Explorer playshops in the immersive exhibitions provide a wide range of interactive activities that use creative play to engage children and support development of communication, creativity and literacy skills. The artist led workshops complement the national curriculum and support core language, literacy and key skills. All sessions are accessible to, or can be adapted for, disabled, SEN and EAL children. Lunch space can be provided by prior arrangement only. For an additional fee of £7 pupils can complete a Z-arts Discover Arts Award as part of their visit. Take advantage of our special offer in partnership with Stagecoach. Bring your class on public transport to Z-arts for only £9 return. Your group may travel on any Stagecoach buses to/from Manchester City Centre as well as Stagecoach bus services 38/86/250/256 which serve the Z-Arts Centre on Stretford Road and the A6. Please contact gill@z-arts.org to book.